A chest rig is one of the essentials to ensure that you carry out your task efficiently. A right chest rig enables you to carry useful equipment such as ammunition without having to carry a backpack. Also, it offers some protection to your chest as well as acting as a storage space for maps and other relatively small things that needs to be quickly available to you. Here is a detailed review of HSGI AO chest rig. The review focuses on its features, benefits, pros and cons. 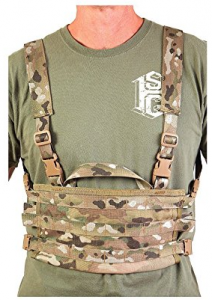 The HSGI chest rig is a small chest rig, it’s quite low cost but it’s still rich in features. This chest rig’s front is efficiently constructed to offer the user eight columns and three rows of PALS. Also, it has inside openings where you can store maps. This chest rig has a carry handle attached to the top to make it easier for a person to drag you in case it’s needed. 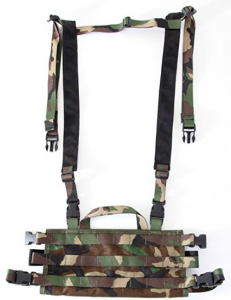 Also, HSGI chest rig comes with a H-harness, which ensures that the weight of the chest rig is distributed evenly. This creates comfort above the X-backed should straps which help to tighten this chest rig on the user’s body. Another benefit of using the HSGI AO small chest rig is that it is quite lightweight so, this ensures that the you do not get tired easily and can wear it for a long time. HSGI is determined to create the best battle proven tactical gear available. All their small chest rigs have been designed based on the feedback from various users and the operational experiences. These products are designed to offer the highest possible level of functionality, versatility, and comfort to the user. It is ideal for tactical use. It’s a small chest rig so it’s not suited for very big people or to store lot’s of mags. From this review, it is clear that the HSGI AO chest rig is an ideal chest rig for people who do not need a big chest rig. The rig is lightweight and can carry a molle pouches along the way.